The release of Sgt. Bowe Bergdahl, said to be America’s last POW, comes amidst criticism and concern. Barack Obama, as president, is supposed to notify Congress 30 days in advance of any prisoner’s release from Gitmo. His decision to exchange five of the most notorious Taliban terrorist leaders held at Guantanamo Bay for Bergdahl, without following the protocol put into place for prisoner release, has faced criticism that such a move is illegal. While Obama stated that Bergdahl’s health was failing and he didn’t have 30 days to wait, the BBC reported that Bergdahl was in good health. Beyond that, the actions of Bergdahl’s father Robert, both before his release and afterwards at the ceremony at the Rose Garden on Saturday, is causing speculation as to the real story behind his son’s release. On May 28th, Robert Bergdahl tweeted what now is an eerily disturbing message. The tweet has since been deleted, but was documented by Twitchy. In addition, during the press conference at the Rose Garden announcing his son’s release, Robert gave a message that sounded similar to the one released by the Taliban after their terrorists were released. 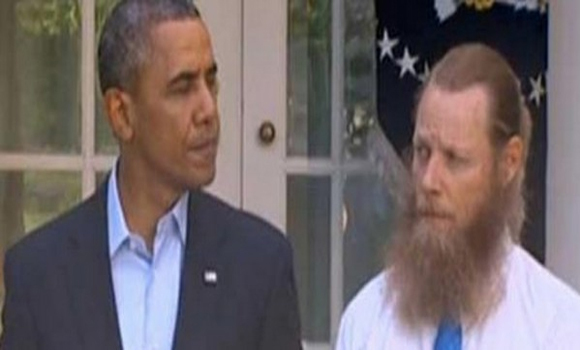 After Bergdahl’s praise to Allah, Obama gave him a big, heartfelt hug. In what can only be described as alarming, the Twitter account @ABalkhi, to which Bob Bergdahl tweeted that he was working to free the rest of the Guantanomo prisoners, is the Twitter account of the Islamic Emirate. Do you think Obama should have negotiated with terrorists in trading five top Taliban terrorists to free the POW? A traitor is a traitor. And so it is with the released and the one who release him!